The newest kids on the block are Google’s own +1 and Google+ services . The Web giant has entered the ring, without any hesitation, and wants you to join its network. Of course, Google has some secret weapons in arsenal, and you’ll want to use or encourage both services if you’re concerned about SEO or your rankings in Google’s SERPs. While there are a few SEO practices you can use on your website where you have control, the same isn’t true for your Google+ profile, because you’re limited to specific text fields. When users search on the social network, people get higher priority than pages. Note that the name field has the most significance when it comes to pages, but Google wants you to use your real name. Just make sure you’re using your taglines and inputting that keyword in all fields, like the tag line and introduction. Is the “+1” button Relevant? When you first signed on to Google saw +1 results, you probably realized that Google wants us to use this service. The intent is obvious: bring more relevant and localized results to individuals. However, you can quickly see where it falls apart, too. Just because you know or love a person doesn’t mean what they think is worthy of reading is something that interests you. These +1 results might also be knocking more relevant pages off the front page, and no one wants to hear that. Google has already recommended that you add the +1 button to your website to encourage users to click it. This indirectly affects the rank of your pages, and the more genuine users who sign off by clicking that button, the better. You can already see this in effect. When Google rolled out +1 and Google+, critics were quick to point out that the company was doing nothing new. After all, Twitter and Facebook have allowed social searching for years. Still, Google seems to have taken this a step further. There’s far more searchable content on your Google+ page, for example, than your Twitter profile. Plus, Google uses longer and more descriptive titles, which just happen to be more friendly to both humans and search engines alike. Another difference is the author information that Google will now display with articles, which include up to three links to G+ and only one to your website. In fact, the company has incentivized the use of Google+ by showing author photos when you link to your G+ profile on your own website. 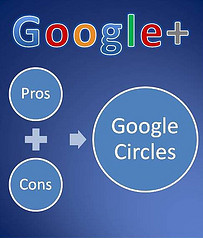 Google Plus also differs from Twitter in that circles allow you to more quickly gain followers because of its Circles feature. Google once counted shares, also known as “retweets” on Twitter when calculating page rank. Since the advent of Google+ and +1, Google has stopped using the number of retweets to influence a page’s ranks in the SERPs. Instead, Google is placing more significance on websites shared with its own services. Twitter is still influential, of course, but not nearly as much as it once was. That it’s too soon to tell is really the running theme when you consult any SEO experts. Google+ and the +1 button are already affecting website rank, but more people will need to use these services to produce any sort of major long-term boost. Both search result relevance and SEO require people to use the services. If you can encourage your readers to do so, you might have the advantage in Google’s results, but Google+ thus far has a telling lack of interest. Benjamin Sawyer is in Internet marketing for almost 5 years. He is a professional blogger and SEO consultant for various clients. Currently, he is also a content writer for www.newyorkstatedivorce.com , a top tier matrimonial law firm from Long Island, New York.